I ran across this recipe online and made them up as an afternoon snack. This is 1/3 the recipe listed below (4 eggs rather than 12). What a perfectly FABULOUS Asian variant on an American classic appetizer. These were full of delicious! You do have to make them ahead of time as the eggs marinate in a mixture for at least 4 hours, but oh are they worth the wait. Hard to see from the picture but you have a nice chestnut brown finish to the outside where the soy, sake, anise, ginger and scallions soaked into the egg, nice and salty and sweet. 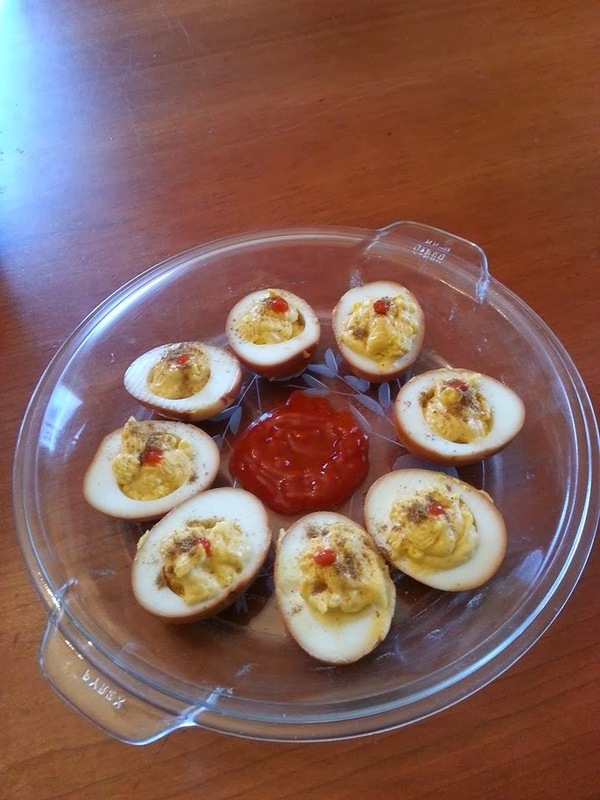 The yolks were mixed with sriracha sauce and wasabi and mayo - so zippy but not burn your mouth off zippy. The puddle in the middle is more sriracha to zip it up. They are sprinkled with 5 spice powder instead of the traditional paprika. These are not for the faint of tastebud - they are spicy - but they are not rip your face off spicy. They could be spicier of course - more Wasabi and Sriracha in the mix. Facebook Post by Lee Drake.